20% OFF! 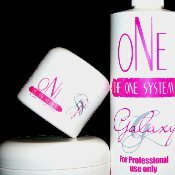 One System Starter Kit #2 includes Little Guy Kolinsky Brush, all 4 of the One System Pink Powders, Pink of Pinks, both of the One System White Powders with the revolutionary primerless liquid giving your clients a wide variety of looks and creates the perfect set of pink and white nails. One System is pigmented to eliminate marbelization. no crystallizing, no yellowing, works in any climate, moderate to quick sculpting time, soft polymers for flexibility, no bubbling. A one of a kind, revolutionary liquid that is truly primerless, eliminates lifting while intensifying colors, low odor, smooth application, UV stable, violet in color. Kit consist of Kolinsky Little Guy Brush #8, 4 oz One Liquid, 2 oz Barely Pink One Powder, 2 oz Sweet Pink One Powder, 2 oz Think Pink One Powder, 2 oz Cover Pink One Powder, 2 oz Real White One Powder, 2 oz White Lightning One Powder, 1/2 oz Balance, Instructions. $154.25 Value!